I love this song! It’s a good match with the Charleston and I always expect Katie to approach each dance with gusto, even if she’s not consistent in terms of quality. (Also, I would literally KILL for legs like Katie’s, although they would look odd on my potato-esque body. Que serra, serra.) Katie definitely Gave Good Face, but there were points where she kind of lost it a bit and seemed to hesitate. It’s definitely hard to be a ballroom specialist in a year when the Charleston is king. 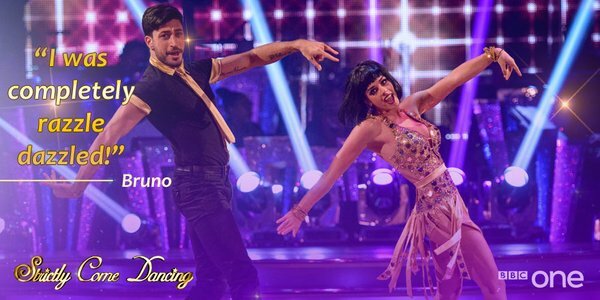 Ouch, a low score for a semi-final dance AND a Charleston. Ack, would you want to be the first Viennese Waltz after last week’s East End gin palace barnstormer? It is Jay though, so whatevs. I’m not ashamed to admit that Bryan Adams is a guilty pleasure of mine, but I’m not a massive fan of this schmaltzy song (mind you, it could have been Everything I Do, so let’s not cut our noses off to spite our faces here.) This was OK. I’m not a huge fan of the Viennese, if I’m honest. I loved Aliona’s dress though. I’m not going to lie- I didn’t hear a lot of the critique because D was being a bit annoying. Not so subtle message after last week’s (quite frankly unjust) stint in the dance-off. Georgia will probably garner sympathy this week with the audience though, what with the shock that she was in the bottom two AND a complicated sounding sore throat. However, for me, this felt like it took a long time to get going into the actual dance. Once it got going though, it was fun. Everyone knows how hard it is to party when you just want to be home in your pjs, right? I do LOVE a proper glitzy foxtrot, none of these slower ones that seem to have been en vogue this series. I loved this- there’s a lot to be said for sticking to the classics, even if your (gorgeous) dress looks like a cross between flamingo roadkill and Animal from the Muppets. I’d like to own that dress, please. I thought the marks were a tad harsh, but then what do I know? Oh, God. I find both the rumba AND this kind of dreary song so bloody boring. So I just KNEW how much I’d love this dance. Also, who has Kellie cheesed off in wardrobe? Anyway. Rumba. Yeah. Fast bits, twirly bits. OK. Some bits seemed quite fast. It wasn’t too raunchy, which was good AND they didn’t use any props! Hurrah! 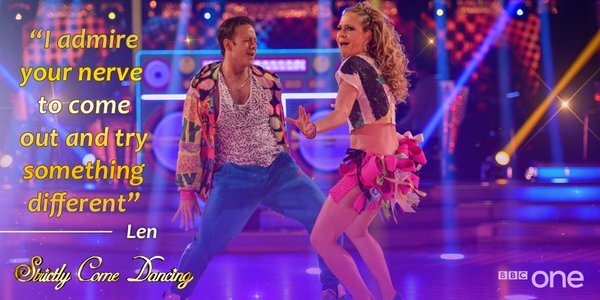 You always know that Katie and Anton in a classic ballroom dance will be (or at least, should be!) lovely to look at. 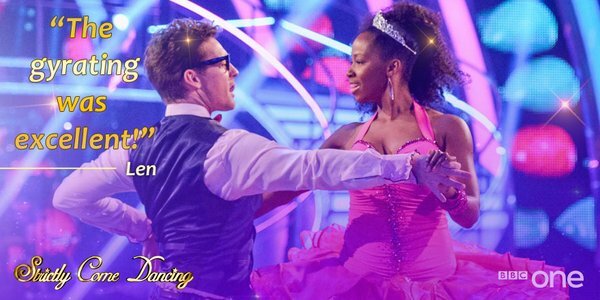 I had high hopes after earlier’s shakier Charleston; if Katie can’t do a waltz well, I don’t think I can believe in anything any more. Including Christmas. I could tell that this was going to be A Serious Dance, as Strictly had got the smoke machine out. As predicted, Katie did well, but I thought there were a few little stumbles (as mentioned by Len.) I’m not sure Katie will be in the competition next week. Jay has a lot to live up to since that amazing jive a few weeks ago- but I wondered if he would be able to do ‘the face’ better than Peter Andre could. That being said, there’s a sort of innocence about Jay which never makes him look like he’s trying so hard; he doesn’t appear to have that same sort of hard-bitten professionalism that some of the other contestants have had this year. This dance just SEEMS made for me- my favourite dance with a Doctor Who theme. This just made me grin from ear to ear- it was so much fun and slightly messy. LOVED IT. Also, I want some glittery Converse. Both waltzes this week appear at first glance to be pretty traditional. 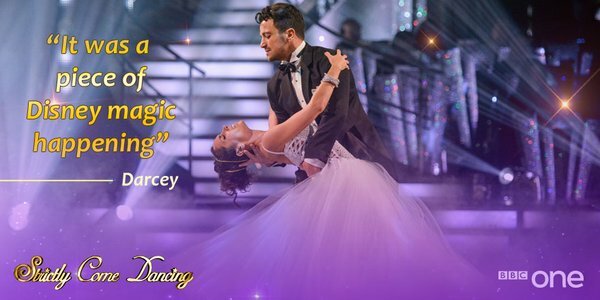 But there’s no denying that Georgia does do princess-y ballroom and the judges love it. (Although between you and me, I think two Viennese Waltzes this week has been a bit of an overkill.) This was pretty, in spite of the band’s weird take on the song. I like to think the guitar-y bits were a tribute to Jim Corr, AKA The Forgotten Corr. Why do people keep encouraging Pitbull (known in my house as ‘that odious little man’) by using his music for stuff like this? Before tonight’s show, I reckoned on this being the weaker of Anita’s two dances. I liked the futuristic cheerleader routine, even if Benn did ask why Gleb was dressed like Freddie Mercury for a Pitbull track. It did seem quite a complex routine though, blimey. Ooh, this is quite Anton-esque in terms of dance and song choice, innit? The dance itself was such a lovely end to the show (especially after that futuristic-cheerleaders-on-speed routine) and I will always, ALWAYS have time for old fashioned glamour in dance. All the little Fred and Ginger touches and the Art Deco set design just made this so beautiful. So, at the top of the leaderboard we have KELLIE and KATIE is at the bottom; I predict Katie and Anita will be in the bottom two tomorrow, with Katie leaving. But then, what do I know? I’ve got it wrong every sodding week. Benn and I have been listening to BBC6 Music’s History of Britpop stuff this week and we had a discussion about it last night; I loved Britpop, Benn was more into dance music (he was a strange child.) It was a funny time for me, the mid-90s. I was a bit too young for grunge (I discovered that later) and I distinctly remember loving Pulp before The Spice Girls even arrived. Anyway, I thought I’d put together a playlist of Britpop classics for a sunny afternoon! By the way, in the comments, can you tell me which band was the best of the genre? Benn and I disagree. I’ve had discussions with my friend Alex about how The Bluetones are one of the more underrated Britpop bands. I love this song and never get bored of it. Elastica are one of those bands I’ve learnt to like more as I got older; they didn’t really register on my radar at the time of Britpop. Sleeper- What Do I Do Now? I love this song. I loved it when I was a kid and I always wanted Louise Wener’s haircut. Alas, my hair did not want that haircut. Despite what I said about Oasis, Definitely Maybe is one of my all time favourite albums. I just liked them before they got a bit messy. Unlike with Oasis, I prefer Blur’s later stuff (as this was released at the end of 1995, I reckon it still counts as Britpop). It’s a shame British Gas ruined what is essentially a lovely song with quite a scary message though. Remember when one of Dodgy was engaged to Denise Van Outen? No? I do. Anyway, as a kid, I loved Dodgy’s exuberance and joie de vivre… another underrated band. I haven’t done a playlist for a while, so thought I’d stick something together that screams AUTUMN to me for various reasons. It seems that all my choices are quite reflective and quiet. I suppose autumn is a bit like that for me- and I wouldn’t change it for the world. Fun fact- in my old staffroom, there was a weird mould/damp patch that looked a bit like Kate Bush. Anyway, to me Wuthering Heights is the book to read in the autumn, all bleak moors and so on. Plus there’s something about Kate that is super autumn-y, but I can’t put my finger on it. I think the feel of this one is perfect for the time of year; a bit eerie and reflective as well as slightly haunting. One of my favourite songs ever. The first time I heard this, Antony Hegarty’s voice terrified me. Now I love it. It’s sad, melancholic and utterly beautiful. I like to put this album on when I’m in the house alone and it’s dark outside. This is my all-time favourite Tori song (and Tori is one of my all-time favourites herself.) I genuinely want this played at my funeral, it is so beautiful.